Gatchaman Crowds is a 2013 anime television series produced by Tatsunoko Production and directed by Kenji Nakamura. Utsu-tsu is one of the characters in Gatchaman Crowds, she is somewhat short compared to other girls her age. She has long green hair that includes a pair of bangs, and two tufts that extend from the top of her head and that move and act as "ears" with her moods. She has green eyes and oval shaped eyebrows. 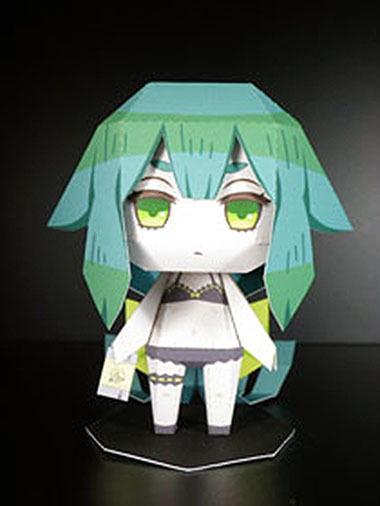 Paper toy from Niseke Japan website.